This fall monthly updates are rolling punctually for Samsung devices. The latest November security patch for Galaxy S8(plus) is rolling under the wire as you read this. It comes with firmware build number G950FXXU1AQK7 and G955FXXXU1AQK7 for S8 and S8+ respectively. The update is seeding over-the-air(OTA) from Netherland and will gradually roll to rest of the globe. 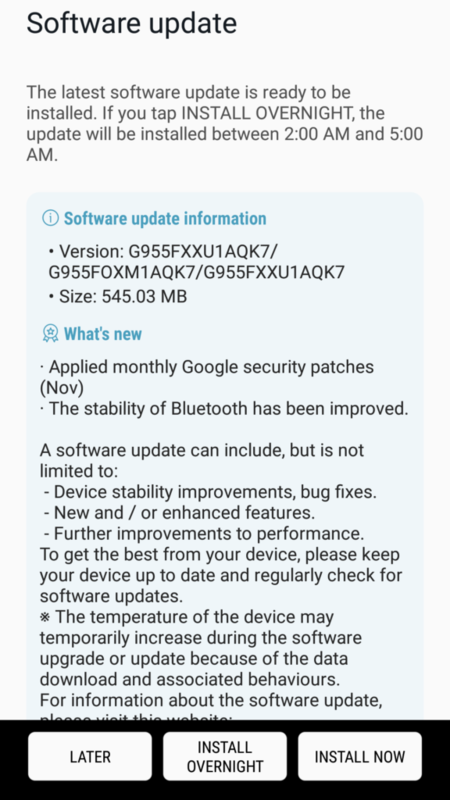 Along with the monthly Google security patches, it also fixes the Bluetooth stability. You can check the full changelog below. Galaxy S8(plus) is the first Samsung device to receive Android Oreo Beta in three batches. The third batch of Android O Beta is rolling currently for Galaxy S8(plus). Now the latest security patch is icing on the cake with Android O. Apart from the OTA, the latest stock firmware is also available that bears the November security patch for Galaxy S8. You can manually install the firmware, the details of which you can read below. Here is the complete list of changes and updates the monthly patch carries with it. Here, take a glance at the build details of the firmware bringing November security patch for Galaxy S8(plus). Your device will capture the OTA automatically when it rolls. But you can manually check for the same by going to Device Settings> System Update > Check for Updates. Download and install it if it is available. You can directly download the firmware from Samsung servers using SamFirm and Odin Tool. How To Install The Latest Firmware? download the firmware zip file from Samsung repository or third party links. Now extract the TAR file. Open Odin Tool > Place the TAR file in the AP section. For a detailed tutorial check the following link. Therefore, this is an important update that you should not miss. Grab the OTA or install manually and update to the latest security patch level on your Galaxy S8(plus). Also, keep scrolling AndroidSage and follow our social media pages for all latest updates and downloads regarding Galaxy S8(Plus).